I was one of those rare kids who loved oatmeal as a child. I didn't understand why anyone wouldn't. Of course, it wasn't until years later that I realized the reason I liked it so much was because it made an excellent vehicle for the vast amounts of margarine (no butter in our house!) and brown sugar I loaded into it as soon as I was old enough to make my own. Once I got a little older and wanted to eat more healthfully, I didn't like it nearly so much. Without the margarine and sugar it was gluey and slimy, with no redeeming features whatsoever. I began to get the idea of why no one else liked it. Flash forward quite a few years, when everyone began touting the potentially cholesterol-lowering benefits of the oat. I decided to give it another try, and just decided I would use the butter (yes, butter by now) and brown sugar much more sparingly - just enough to sweeten the pot, as it were. Which worked fine for a few days, but each day would find me adding just a little bit more butter and brown sugar, until once again there was just a little bit of oatmeal to go along with my bowl of bad. And then I watched my sister-in-law add just a little bit of water to a cup of old-fashioned oats (as opposed to the quick-cooking with which I had grown up) and microwave it for a couple of minutes, after which she added about a fourth of a cup of halved red grapes. Hmmmm. There's some healthy sweetness. I gave it a try, and it wasn't half bad. I went home determined to start eating it more regularly. One of the benefits of the old-fashioned oats is that they are whole, and if you cook them with less liquid than the instructions indicate, they are not nearly as gluey and slimy as when they're cooked with a lot of liquid. There's less liquid to absorb, so they don't soften and clump up quite so much. But of course I had to improvise on the theme. I liked to add a little milk to beef up the protein and make it a little less dry, and without even thinking about it I started nuking them with milk instead of water. It made them a little more creamy, without entering the slimy/gluey range. And the freshness of the grapes complemented the flavor of the oats rather than covering it up like the butter and brown sugar, so I was able to discern an actual flavor to the oats, and it was a good flavor. It became my regular breakfast, seasonally, for quite a few years. Why seasonally, you ask? My sister-in-law lives in Texas, where in-season produce tends to be available for a much longer period than it is here in the midwest. I don't know about where you live, but around these parts we get good grapes for oh, about a month or two if we're lucky. They're decent another two months or so, which means that for three-fourths of the year I have no grapes with which to sweeten my oats. I had to find a substitute. Raisins came to mind. I like raisins, but I do not love them all by themselves. I liked them best mixed with nuts and other dried fruit. I thought nuts might complement the toastiness of the oats, while the fruit would provide the sweetener. It's more healthy that way too, because as good as dried fruit is for you, it has concentrated sugar, so it is best to not to eat too much of it, so I learned to mix it at a 2 to 1 ratio nuts to fruit. It worked beautifully, and I could now enjoy my oatmeal year round. One of the reasons I switched to old-fashioned oats is because I had been reading up on whole grains, and almost everyone agreed that you get the least bang for your buck with instant oatmeal, followed by quick-cooking, and then old-fashioned, with steel-cut oats being the grand poobah of whole-grain healthiness. I settled for next best. It takes a good half hour to cook steel-cut oats, and you have to cook it on the stove top. I had gotten in the habit of taking my oats, milk, and fruit and nut mix to work with me and nuking it right then and there for my breakfast. After I quit my job back in '05, I had some time on my hands for the first time in a long time. One of the first things I decided to do was buy me some steel-cut oats and see about cooking them. I found them at my local grocery store, but the name brands they offered were expensive - like three times as much as the quick-cooking and old-fashioned kind, so I held off, until I was at Trader Joe's and saw that their brand was much more reasonably priced. I brought it home, experimented with it, and never looked back. You can actually find steel-cut oats in bulk in many places as well, which is also more reasonable than the name brands. I had no idea how to cook them; I only knew they took a while, so I went online to search out cooking instructions. Luckily, the first site I happened on suggested that the oats be toasted first. One benefit is that it helps the oats cook faster; the other (but by no means secondary) benefit is that it imparts a nutty flavor that is brought out even more by the nuts. So I pre-heated my oven, toasted my oats, and the next day I cooked up my first batch. It was quite good, and completely different from the old-fashioned oats. Even though it cooks up into a pretty good mush, there is a solid core at the center of each little piece of oat that adds texture to every mouthful. I cook it in water, and then add milk at the end. It's better to cook steel cut oats in larger amounts than just the one serving, but it keeps beautifully in the refrigerator. When I went back to work, I got in the habit of cooking up a batch, then portioning it out into serving-size containers that I would take to work with me, add some milk, and nuke up just like I did with the old-fashioned oats. It's actually not bad with a mashed banana and cinnamon, but my favorite is the fruit and nut mixture. I have started buying my fruit and (unsalted) nuts separately and mixing them together myself. It lets me take advantage of sales, and it is also lets me control the proportion of the ingredients. When I am feeling a little more flush, I will use cranberries and pumpkin seeds; when I'm not feeling so flush it's raisins and sunflower seeds. I never thought I would have this much to say about oatmeal. But now that I am making it with steel cut oats and eating it with a little milk and dried fruit and nuts, it is both healthy and delicious and, as my mother would say, it sticks to your ribs. Not a bad thing with cold weather coming. Preheat oven to 375 deg. F. Place oats in a shallow baking dish. When the oven is ready, place the dish in the center rack. Bake the oats for about 40 minutes, checking and gently stirring them in ten-minute intervals, until the oats have turned a light brown and emit a warm, toasty aroma. Let cool completely, then place in an air-tight container. Place 4 cups of water in a medium (at least 3-quart) saucepan over high heat and bring to a boil Add oats (and 1 teaspoon salt if desired) and cook for 5 minutes, stirring frequently (be careful not to let the pan boil over at this point). Bring the heat down to low and simmer, stirring occasionally, for 20 minutes, or until the oats have absorbed all of the liquid. Serve with milk and your favorite oatmeal toppings. I use red grapes cut in half, a dried fruit and nut mixture, or sliced banana and cinnamon. If you are not serving all four portions immediately, you can either store it refrigerated in one large container and spoon out servings, or save it in individual-sized containers. To reheat, simply place the oats on a microwave-safe container and nuke on high for 1 minutes, then at 80% power for 1 more minute. (If you do both rounds on high, be sure to keep an eye on it - it can boil over pretty quickly.) I add about an eighth of a cup of milk when I reheat it, but it isn't necessary. 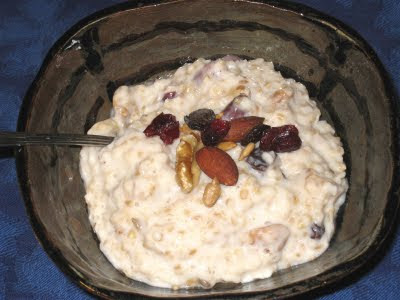 You can make more or less than four servings at a time; the ratio is 1/4 cup oats to 1 cup water. Hi, the recipe in the pic is looking delicious.I do like oat meals. By the way thanks for sharing this wonderful article.